Whether an individual with autism, dyslexia, learning disability, nonverbal learning disability or someone who sustained a head injury or cognitive decline, components of executive functioning can limit functional capabilities in all areas of occupation. For students planning, memory and temporal organization are frequent challenges with recalling the who what when where of many tasks. Recent work with secondary students who have significant organizational and planning challenges but with specific strengths in visual and auditory abilities resulted in a quest of planning apps appropriate for a tablet computer. My search resulted in a few great apps appropriate for middle, secondary and post secondary school. Tools needed for the students were similar despite one being dyslexic and the other ASD. But of course, it is never a one size fits all! 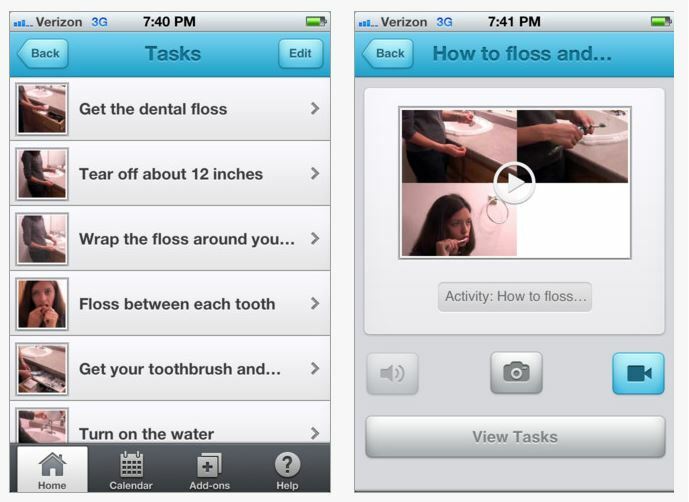 Functional Planning System app for iPhone/iPad (currently 1.99 for Autism Awareness Month) typically 4.99 developed by Conover Company, provides audio, video and calendar options for tasks added. FPS also allow repeat feature to tasks by day and week. Within a task list a check off is provided. The audio, video and picture support is extensive with the ability to save tasks as an activity providing a sequence of tasks to support work completion. In app purchases are available for specific, premade sequenced task instruction. Tasks as shown below can be listed according to days of the week with scheduled classes listed for the student. Using the edit button, tasks can be rearranged on the list allowing choice by the student. CanPlan App for iPhone and iPad (free with in app purchases) was developed by CanAssist at the University of Victoria. Provides customization with images, audio and speech. Views provide day and week views of task lists. Settings provides numerous methods of customizing alarms, audio and speech, what features are included in the views including task icon size. The free version is limited to 3 tasks. Unlimited task entries costs 44.99. 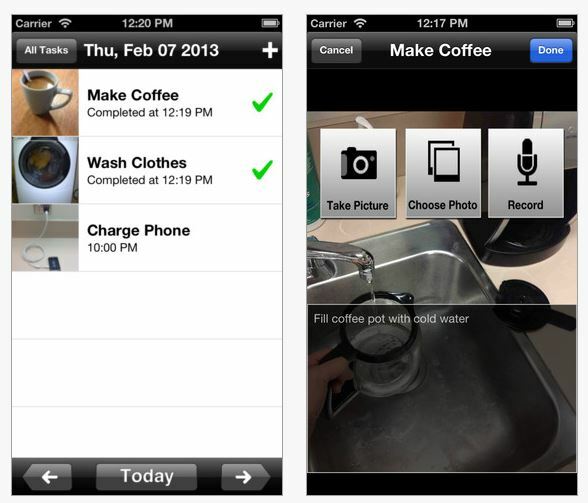 Picture Scheduler app for iPhone and iPad provides a simple listing of tasks with audio and image support. This app does not have a check off list but does provide the opportunity to list classes and organize tasks within a class folder or as a category. Images, video, audio, alert and repeat function is available in this app. This app does not have a calendar view but reminders can be set by the day, month with repeating capabilities. For students who can be trust worthy of using the editing mode, items can be added or ordered for each day in the app. 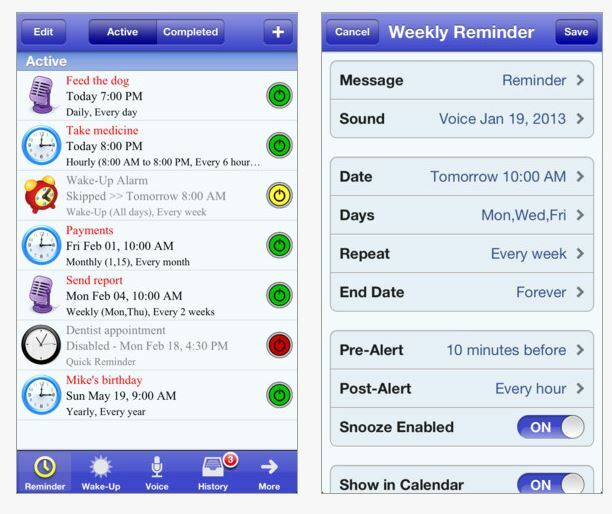 Aida Reminder with Voice this app for iPad and iPhone (.99) provides limited customizable picture support but does provide audio alarms and the ability to record your own audio reminder. Basic images for a Quick Reminder, Reminder, Wake – Up and Voice Reminder is provided but no customizable image features. The basic images can be seen however within the calendar recording providing basic visual support. Day and monthly calendar views are available. A variety of other features for alarms and pre-alarms are available. Pocket Planner app for iPad (free) has visual images within a calendar. Many options are available but appeared very busy. Requires a purchased desktop version to work. Visual Schedule Planner app for iPad (14.99) developed by Good Karma app providing visual, auditory system that is customizable with many features. Use a weekly homework log that is sent from school to home and back, keeping all parties informed of work due and progress. Assignment checklists can be used to break large, often overwhelming tasks into manageable unites. Day planners, including PDAs, can help organize your child. Allocation of sufficient time for instructions, repetition of instructions, and individual student assistance. Executive Functioning and Theory of the Mind (n.d) Retrieved on April 14, 2013 from: http://www.autismspeaks.org/family-services/tool-kits/asperger-syndrome-and-high-functioning-autism-tool-kit/executive-functioni . Meltzer, L., 2007 Executive Function in Education, Guilford Press, New York. What are your favorite scheduling apps? Post a comment to share! More for your teaching, parenting, or OT mTool Kit! This entry was posted in App Reviews, Apps for OT's, Apps for Special Needs, Customizable app, High School, iPad, iPhone, iPod, Middle School, Occupational Therapy, Organization, Post secondary, School Based Interventions, Special Needs, Visual Communication and tagged App Review, iPad, iPhone, iPod, occupational therapy, Organization, OT Apps, visual communication. Bookmark the permalink.